Local accommodation number: 4330/AL. Situated in the Natural Park and only 5 minutes walk to Salema Beach, this spacious apartment is in the Salema Beach Club tourist complex. The lounge has a communal balcony that offers a wonderful view of Salema and the sea. Both bedrooms and the lounge have panoramic sea views. There is easy parking and a large, communal swimming pool with children's paddling pool, plus shops, snack bar, and Reception. 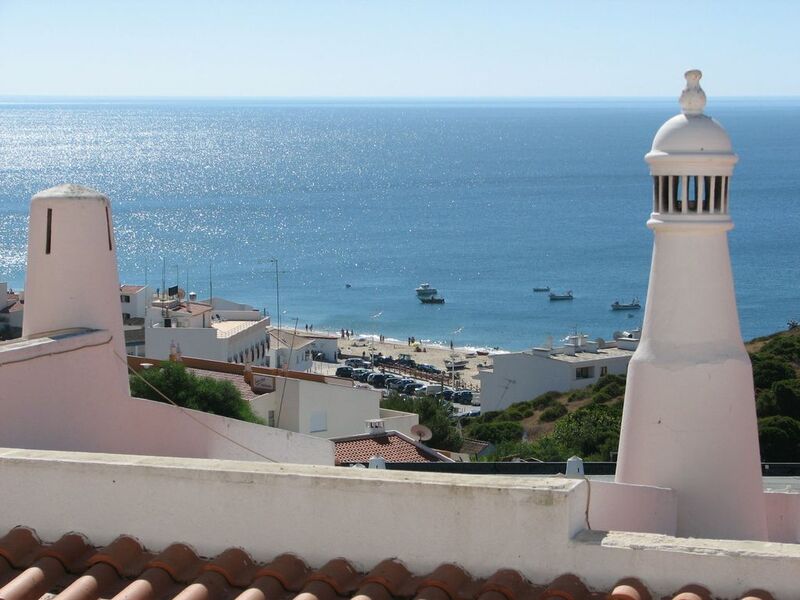 Salema is a picturesque, small fishing village offering a fine sandy beach with ample choice of bars and restaurants huddled among fishermen's cottages. Perfect for sun-worshipers, walkers and birdwatchers. Please note that this apartment was originally built to British specifications in the 1980s and is typical of the area. It has a lovely homely feel very different to the latest modern 'boutique-style' apartments in the village. We're based right next to the sea, so there will be some days of high humidity as well as wonderfully sunny weather. Please let us know if you have any allegies to the seaside. Late arrivals can order a Welcome Pack of food & drink at extra cost - just ask when booking. Julie and I live in a little village on the edge of an historic East of England market town. We both work, and enjoy walking, ski-ing and living in the countryside, but head out to Portugal for most of our holidays in Salema, which we really love. We love Salema because it is so unspoilt, and as part of a National Park will always remain so. It's a typical fishing village, very friendly and never gets as crowded as other parts of the Algarve. There are some wonderful walks, amazing beaches and the sea front boasts a great range of bars and restaurants. There really is something for everyone here, especially families. We also liked the fact that the area is easily accessible, with Faro airport just over an hour's drive away. The property is just five minutes walk from the fabulous beach. We provide umbrellas, games and even some videos and books, so you can travel light and make the most of the great coastline. For those who enjoy a more active holiday, you can play golf (the Parque da Floresta course is at the top of the road), walk in the national park or along the Via Algarviana long distance footpath, discover stunning, hidden coves, or head over to the West Coast surfing beaches just 15 minutes away. If you're looking for great food, we can also recommend local restaurants in the village or nearby. Just ask for information when booking. Fully tiled bathroom with bath/shower over and wc. Towels and linen are included. Cleaning service weekly; for 2 week holidays there will be 1 change of towels/bed clothes etc. There is parking above the apartments - very useful in busy times as the beachside parking is very difficult in high season. There is free WiFi with a 30Gb limit and usage for up to 5 devices. If you require more data this can be easily bought on request of the owners. Towels are included, as well as beach towels. For 2 week holidays there will be 1 change of towels/bed clothes etc. The spacious lounge has DVD player, video player, books - fiction/non-fiction and a CD/music unit. It has a dining area and a balcony, that offers a stunning panoramic view of the Salema coastline. There is a small freezer compartment in the fridge. Table and 4 chairs ideal for outside eating. Balcony at front with sea view. Please note the TV is for viewing DVDs and videos only. We have a bookshelf stacked with good reads. Feel free to borrow a book during your stay or swop books if you've finished reading. Please always replace books so others can enjoy this free feature. Some games like cards, chess, draughts and scrabble are available in the apartment, but we recommend you bring your own. There are also beach games in the cupboard in the corridor between bedrooms. Communal balcony, that offers a stunning panoramic view of the Salema coastline. Parque da Floresta Golf and Spa Resort is a 5 minute drive away, with an 18-hole championship course (home to David Seaman Safe Hands Charity Classic), tennis, archery, restaurants and fantastic day spa. Boavista Golf Resort only a 15 mins drive towards Lagos - also a championship course, which hosted the Sir Henry Cooper Mike Reid Charity Golf Classic. Palmares Golf - also close to Lagos can easily be reached within 15 minutes of Salema. A well established course laid out on a hillside commanding magnificent views of the bay of Lagos and the distant Monchique hills. Huge shared swimming pool, plus children’s pool, with security gate, solely for use by those using the apartments. Notes on accommodation: The apartment is ideal for 4 people but a single fold-up bed is available for a fifth person. Due to stairs leading up to the apartment, the accommodation is not ideal for young children or the elderly. The apartment can be heated and is suitable for winter rentals. Notes: sorry - no pets allowed. No smoking at this property. Outside: Balcony at front with sea view, ideal for lounging and watching the world go by, with access from the living area. Table and 4 chairs ideal for outside eating. Huge shared swimming pool, plus children’s pool, with security gate, solely for use by those using the apartments. Please note if the swimming pool card is lost, the cost of replacing it will be deducted from guest's security deposit. Set in the Salema Beach Club complex which includes Reception, shops, and snack bar. Parking at the Beach Club - very useful in peak season when parking can be difficult in Salema. Cleaning / Towels / Linen / Maid service: Towels and linen are included as well as beach towels. Cleaning service weekly; for 2 week holidays there will be 1 change of towels/bed clothes etc. A spacious apartment in need of modernisation. New pillows and mattress cover needed. Tiling in bathroom need regrouting. Perfect location and plenty of toys, surf boards, beach towels etc. Overall an enjoyable stay. Thank you for your comments which we will take into consideration. I'm glad you had an enjoyable stay - which is the main thing in a holiday. As we say on our website description, although our apartment is not the most modern in Salema we do feel it offers a cosy, friendly and homely atmosphere. The apartment has been given a freshen up and any problems with pillows and mattress covers should be taken up at the time with our agent on the spot in Salema, who I'm sure would have helped. Clean linen and pillow cases are provided every time and the pillows all have liners from John Lewis to ensure they are hygenic. The bathroom grouting is actually fine, but at the end of a long season, we find that guests rarely leave the bathroom extractor fan on long enough to clear condensation properly so inevitably mould spots appear. We give everything a good clean to ensure it's as we prefer it. Salema is the real star of the show - and we keep our homely little place to enjoy the views and the access to a sublime piece of Portugal. We found the apartment to be damp and cold. The location is very good but the standard of linen etc was not high. We were disappointed to find there was no spare toilet paper(just the roll on the holder), no soap(hand, shower, dishwashing or laundry) as well as no salt, pepper or olive oil. All the other places we have stayed have provided these items plus more. This apartment is located in a quiet development overlooking the ocean. The area has nice places to dine and friendly people are all around. The scenery is lovely, and there are interesting sights to drive (or hike)to. We enjoyed ourselves and recommend this area for couples to get away to. We would not recommend it for small children, though. So glad you enjoyed Salema as much as we do. There’s so much to enjoy - from walks to exploring beaches and gossiping with the friendly locals. Completely agree about small children - or even people who have difficulty walking - because of the steep steps and hills which is why we mention it specifically in our website description of the apartment, and mention about the steep hills. To us it’s a paradise - to some it might present difficulties. We have had parents with small children stay and have no problems. Everyone is different but Salema stays wonderful all year round!!! After a huge hiccup with contacting Ramona cos' her mobile no had changed and also the key code had too all was ok. A slight hiccup with gas which we are used to at home and ably sorted after a while with the local gas guru fine! We loved our holiday in the apartment high up overlooking the roofs and chimneys of Salima and wish we could have stayed longer..... It was such a peaceful place with exquisite beaches nearby, great restaurants, low key tourism and enough mini markets with excellent bread local cheeses and wine. Warm weather and cool evenings ideal for walking up the steps from the village! Couldn't be bettered really.. Also within easy distance of many other villages and towns. Well maintained and well equipped, excellent pool, close to village centre and beach. Well situated property in quiet fishing village. Property was clean, cool and had a well equipped kitchen . Lovely view from the balcony of the sea and village below. Pool looked nice but a bit chilly when we went ( March) . Apartment Would not be suitable if you struggle with steps and stairs. Village peaceful with a few good restaurants and a couple of shops. Seemed the nicest village in the area. Thank you Helen - we love the village and the area and glad you did too. Agree about the steps and the stairs which is why we ensure it's right up front in the property description on the website. As ever though, after the walk up the hill there is the reward of that spectacular view! As well as the beautiful beach of Salema (blue flag status) which is a 5 min. walk from the apartment, there are many secluded beaches in the vicinity (both within walking distance and driving). There is a possibility to go on boat trips from Salema (summer only) and/or walk through the National Park. The West coast (good for surfing) is a short drive away (15-30 mins). The nearest airport is Faro airport, a 70 minute drive (about 100km). Lagos is about 15 minutes drive, with its old town, restaurants, bars and marina. Luz is only 10 minutes by car. Cape St. Vincent (most westerly point in Europe) is about a 15 minute drive. Car hire is recommended in order to explore the other beaches and towns in the area. However if you choose not to hire a car, collection/return trip to Faro airport can be arranged at your own cost. There is an hourly bus service to Lagos. Luz - 10 mins. Lagos - 15-20 mins. Sagres - 10 mins. Cape St. Vincent lighthouse - 15-20 mins. Aljezur - 30 mins. Silves - 30 mins. Monchique and mountains - 1 hour. Everything that you could need for a relaxing holiday is within walking distance of the apartment. Salema has a good range of restaurants serving excellent fresh fish and traditional Portuguese dishes, many with seafront dining areas. There are also a couple of quiet bars and 2 cafes, good for a lazy breakfast. There are a selection of shops in the village, including a small supermarket, a travel agent and internet 'cafe'. There is a larger supermarket at Budens, about 3km away, with a cash machine. The National Park is renowned for its incredible walks, unspoilt beaches and is an ornithologists dream, being visited constantly by specialist walking and birdwatching holiday companies. Booking Notes: A 50% deposit is required at the time of booking, which is non-returnable. Full payment should be made 8 weeks prior to departure. Changeover Day: Flexible. The accommodation is available for incoming clients by 2pm. Departing clients are requested to vacate by 10am. (We can be flexible on these times depending on the arrival/departure times of the previous clients). Notes on prices: Prices are for the property per week in euros. Minimum stay 5 nights, unless low season.